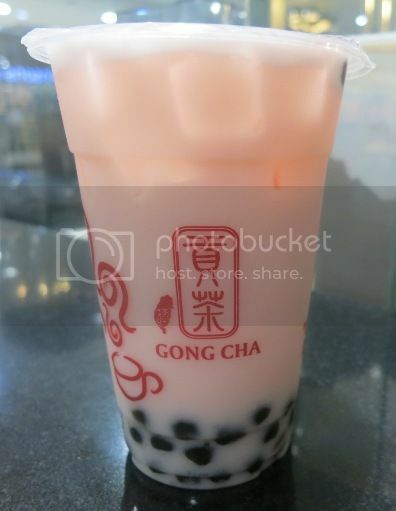 On my first visit to Gong Cha, I tried their Milk Earl Grey Tea, which I liked, by the way. I promised myself that I’d try their Creative Mix next time, and I was able to do that more than a week ago when hubby and I watched a movie at Robinsons Movieworld. Hubby had his usual Milk Winter Melon Tea, but I opted for a Strawberry Au Lait this time. “Au lait” is a French word pronounced as “oh-ley,” which means “prepared or served with milk.” I would have loved this combination had they made it a little sweeter. It’s a good thing that I ordered (black) pearls add-on because they made up for the sweetness that my Strawberry Au Lait lacked, plus I had fun munching these chewy pearls. This entry was posted in Gong Cha, Strawberry Au Lait. Bookmark the permalink.